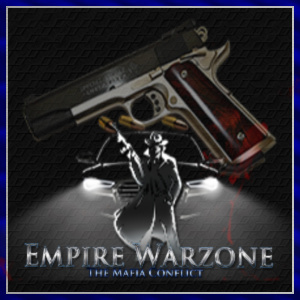 Empire Warzone is a Classic Mafia-themed Browser Game with a Modern Twist. The path to conquering the Empire is laid out before you, when you join! Commit Crimes, Complete Special Ops for points, experience, and cash. Search the Streets for cash, points, and those elusive golden tickets. Buy and train a pet to enhance your own prowess. Those who embrace the game the most we have of the hour and of the day bonuses, for best of the best you can win a weekly payout by winning the Warzone. A Place to fight for top Criminal and Flex your Mafia muscle. Keep an eye out for Seasonal and Holiday events as well. This game is what YOU make it, watch its’ Evolution. Welcome to the Empire! Awesome Game , Staff is Friendly, the Owners interact with players almost Daily! there is always something to do... game also has a Radio In the Tab, and the DJ's Rock.. Having a Station in a Game , Incredible, .. running promotions more than Not... normally no lag unless game is being updated,making game points/money... mug .. training .. the training is better than other games i have played, and they are always making more estates to increase your train.. my list goes on! Love the game! Lots to keep me busy. I do missions and special ops for cash and points. I fight in the Back Alley for cash and experience. I mug and attack players to gain status in the Warzone. Come play with me. ID 4. Tell them Shiloh sent you. ID 4 in the referral id box. Great new game. Staff is top notch Come have fun with us.